I love potato salad in all it’s varieties. There is something a bit special about a duck fat roasted potato salad that pushes it to above the ordinary though, don’t you think? Just yummy. Of course after roasted potatoes sit in a vinegery salad dressing for too long you might as well have just steamed them as well, so be conscious of this when you dress the salad and do it just prior to serving! This salad suits all the menus that a very normal but average potato salad suits (though I know nothing about average...and hopefully neither do you!) Bon Appe-BBQ. Preheat oven to as hot as it will go, minimum 200℃, you can use a grill function at the end of the cooking time to crisp up the potatoes. Halve the potatoes, unpeeled, and cut them into 1-inch wedges. Place the potatoes and garlic cloves into a large baking dish and coat with oil and dollop with a little duck fat. Roast them, stirring them every 10 minutes, for 30-40 minutes, or until they are tender and golden and crunchy. Let the potatoes cool in the pan. Place roasted garlic, vinegars, rosemary foliage and salt to taste into Thermomix bowl and blend 10 sec/speed 9. With the motor running add a 1/3 cup oil in a stream through hole in lid, and blend the dressing until it is emulsified, 20 sec/speed 9. Set aside. Bring 1 L to boil in Thermomix bowl, 8 min/100℃/speed 3. Place topped and tailed green beans into Varoma dish and steam 8 min/Varoma/speed 3. Blanche beans by placing into a large bowl filled with icy water to stop cooking. Drain. 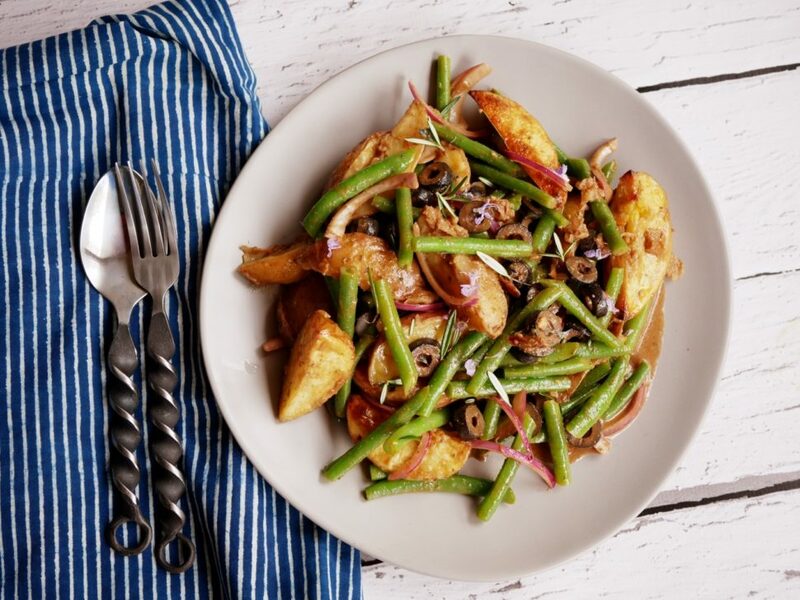 In a very large bowl combine the potatoes, the onion, the green beans, and the olives, add the dressing, and toss the salad gently. Garnish with the rosemary sprigs. Serve immediately. Unfortunately this salad is only good immediately on completion because the roast potatoes will lose their crunchiness as they absorb the dressing quite quickly. You can however, assemble all the elements and then just toss together just before serving.